The United States now produces about as much crude oil as Saudi Arabia does, and enough natural gas to export in large quantities. That's thanks to hydraulic fracturing, a mining practice that involves a rock-cracking pressurized mix of water, sand and chemicals. Ongoing research by Stanford environmental scientist Rob Jackson attempts to minimize the risks of "fracking" to underground drinking water sources. The most recent such study, published in Environmental Science & Technology, finds that at least 6,900 oil and gas wells in the U.S. were fracked less than a mile (5,280 feet) from the surface, and at least 2,600 wells were fracked at depths shallower than 3,000 feet, some as shallow as 100 feet. 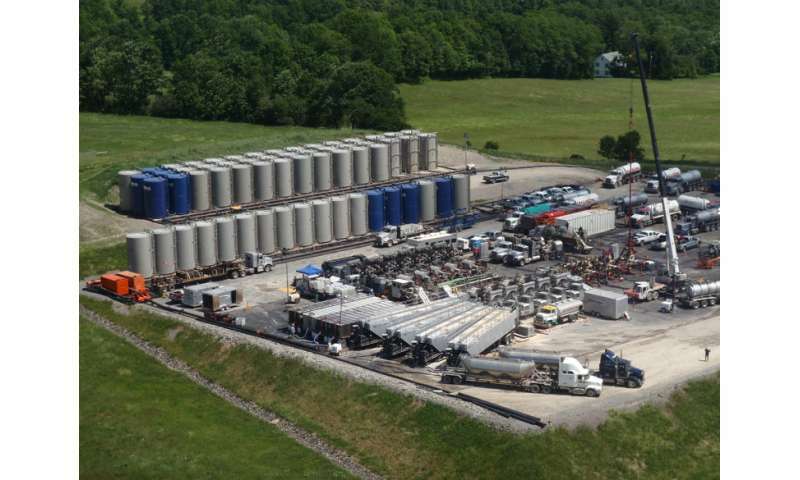 This occurs despite many reports that describe fracking as safe for drinking water only if it occurs at least thousands of feet to a mile underground, according to Jackson. The authors also estimated water use for hydraulic fracturing in each state. The states with the highest average water use per well were Arkansas, Louisiana, West Virginia and Pennsylvania. "Shallow hydraulic fracturing is surprisingly common," said Jackson, the Michelle and Kevin Douglas Provostial Professor in the School of Earth, Energy & Environmental Sciences and a senior fellow at the Stanford Woods Institute for the Environment and the Precourt Institute for Energy. "The places where hydraulic fracturing is both shallow and water-intensive may need additional safeguards." For example, Arkansas had more than 300 wells fracked shallower than 3,000 feet, using an average of 5 million gallons of water and chemicals. Other states that fracked wells shallower than 3,000 feet using more than a million gallons each included New Mexico (16), Texas (10), Pennsylvania (seven) and California (two). Jackson has tracked the dramatic transformation toward energy independence and the pressing questions swirling around fracking's impact on water supplies. "There's a lot at stake economically," Jackson said. "My interest is in trying to make the process as safe as possible." Although fracking in the U.S. produces more than 100 billion gallons of wastewater per year, the process requires significantly less water per unit of energy than extraction and processing for coal and nuclear power, according to past research by Jackson and his colleagues. As part of the so-called frackwater they inject into the ground, drilling companies use proprietary blends of chemicals that can include hydrochloric acids, toluene and benzene. When the wastewater comes back up after use, it often includes those and potentially dangerous natural chemicals such as arsenic, selenium and radioactive radium drawn up from subterranean recesses. Using innovative techniques such as isotopic "tracer" compounds that distinguish the source of chemicals in well water, Jackson has not found evidence that frack water contaminants seep upward to drinking-water aquifers from deep underground. He has, however, shown that failures in steel and cement well casings nearer the surface are often to blame for leaks. While much has been made of fracking's potential impacts on water now, Jackson also wants to understand legacy effects such as chemical leakage through time. "The public pays to clean up acid mine drainage today because of poor practices decades ago," Jackson said. "What are we doing today that may cause problems tomorrow?" In particular, he thinks that states aren't saving enough money to tackle future problems, choosing instead to spend their oil and gas revenues today. While some countries, such as Canada, the United Kingdom and Germany, have instituted or are considering special requirements for shallow fracking wells, most U.S. states lack additional oversight for such operations. Only two U.S. states, Colorado and Texas, have special requirements for shallow hydraulic fracturing. Jackson noted a number of positive changes in the industry in the past few years. For example, drilling companies are increasingly reusing and recycling their wastewater, even though the process is more expensive and labor-intensive than the standard approach of re-injecting it thousands of feet underground.